Kings Go Forth is the biggest band in Milwaukee. And we don’t just mean that literally, though the group’s generously sized 10-person lineup pushes at the perimeter of most stages. 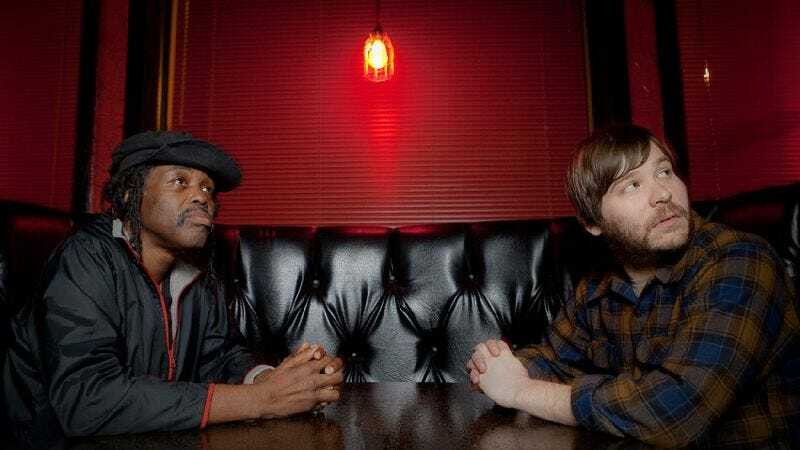 No, Kings Go Forth is big in the “people outside Milwaukee actually care about them” sense, positioning the jubilant soul outfit as the city’s best shot at having a popular musical export since the heady, short-lived Citizen King boom of the late ’90s. The hype accompanying KGF’s full-length Luaka Bop debut, The Outsiders Are Back, was put to the test with a highly publicized run of shows at this year's South By Southwest—and from the looks of the reviews, they passed. Before the band's Saturday show at the Cedar Cultural Center, The A.V. Club met up with leader Andy Noble to count their blessings. 1. That whole “releasing an album on a major label” thing. Andy Noble: I’m actually proud of the record. I think that its boundaries are a lot further out than the typical soul retro acts you’re seeing pop out from all over the place right now. We’re touching a lot of stuff that people haven’t done for a long time, bringing in a lot more arrangements—large-scale arrangement ideas than other groups have done with strings—and tons of vocals. Musically speaking, my excitement right now is to be on the cutting edge with all the other groups that people don’t think of as retro groups, groups that are actually kind of pushing things right now. And I see certain similarities between what I tried to do on this record and some of the other rock groups right now in the sense that big vocal harmonies are definitely not solely the province of soul and R&B music anymore. AN: I don’t want to come off like this dude who hates four-white-dudes rock music because I like a lot of it. But you go there and you see the first band like that and you’ll be like, “Aw man, this is awesome dude! It’s 80 out and there’s awesome food.” Then after the 20th band like that you’re just like, “This is the same band I saw seven bands ago.” I mean, not being that was definitely going to help us out. I was kind of surprised how easy it was to become a SXSW buzz band. We had one big advantage, that we weren’t the same thing visually or whatever. We have dudes in our band who are kind of old guys—our lead singer is in his mid-50s. I saw some girl mention this on her blog too—she said something super funny: “Most of the group were crotchety old men in tunics.” Our group’s weird like that. 3. The backlash hasn’t started yet. AN: We really haven’t gotten much bad press. I don’t know if it’s because we’re some kind of Benetton band that makes people think it’s not cool to write bad stuff about us. When you have the age difference and the race difference people are a bit kinder to you in print. I have received less negative press for this group than anything else I’ve ever been involved with in my life. I’m a critical person. I almost see it as my job being the ultimate critic. The snottiest blog writer who’s going to tear another band apart, I do that all the time, as much as I can. Especially with the music. 4. The band didn’t try to be successful—it was sort of an accident, actually.